SPRING VALLEY, MN – June 3rd, 2012: (Photo courtsey of Buck Monson Photo) Kylie Kath jumped into the early lead in the Hinz Trucking USRA B-Modified feature event with Josh Smith in second. Ben Moudry sat in third early on. With two down Moudry moved into the second spot with Erik Kanz challenging Smith for the third spot now. With two completed the caution flew and on the restart Kath took the lead again but Moudry was charging hard down low and pulled alongside the leader on lap three. Moudry led lap four with Kanz closing in on Kath for the second spot. With six complete Kanz moved past Kath for the second spot and on lap eight Jacob Bleess started to pressure Kath for the third spot. Kath and Bleess continued their race for third to the finish while fifth place Shaun Walski and sixth place Trevor Hunt battled for a spot in the top five. Bleess gained control of third for two laps but Kath was able to secure the spot at the finish. 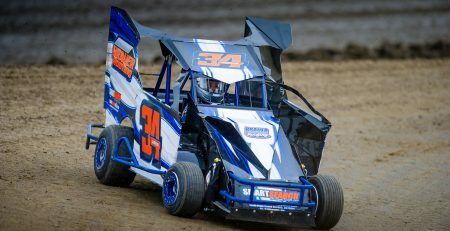 As the checkers flew it was Moudry with his first ever win at the speedway ahead of Kanz, Kath, Bleess and Walski. The Cap N Cork Wine and Spirits WISSOTA Street Stocks put on a great show again with Troy Voth jumping out to the early lead. Behind Voth the field was four wide for second with Nick Schwebach gaining control of second on lap two with Kory Adams in third. With five complete Shaun Mann was challenging Adams for the third spot. As the two raced for third they caught Schwebach and now had a three wide race for the second spot. Schwebach dropped back to fourth as the other two stayed side by side. With eight complete they caught Voth up front and as they moved up to his bumper Mann had the advantage in second. With ten down Mann was now solidly in second as the top three ran nose to tail around the speedway. With thirteen complete Mann moved low for the lead while Voth pushed up slightly in four allowing Mann to take over the lead as they raced down the homestretch. Mann took home the win with Voth Adams, Mike Blowers and Schwebach rounding out the top five. Jeff Born took the lead early in the Dirt Doctor Trucking WISSOTA Midwest Modified feature event with Cory Crapser in second. Dustin Scott took over third early. Crapser took over the lead on lap two while Born and Scott raced for second. With three down Scott took over the second spot as Jared Boumeester worked into the top five. With five complete Born and Tony Schill raced for the third spot. Born held off the challenge until a restart on lap seven. During the restart Born pushed up the speedway as Schill, Boumeester and Cody Gardner shot into the top five. Ten completed and up front it was still Crapser with Scott running a close second. Schill sat in third with Boumeester and Gardner on his back bumper. A restart on lap fifteen saw Boumeester sneak past Schill for the third spot while Scott worked Crapser on the low side. Crapser was too strong and took home the win ahead of Scott, Boumeester, Schill and Gardner. 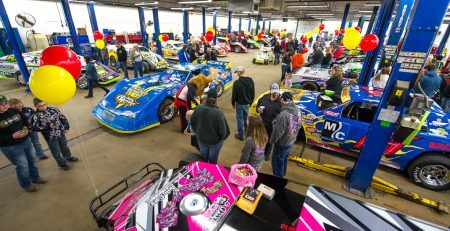 A great field of cars showed up for the Wagner Trucking WISSOTA Super Stock Feature event with twenty cars in the pit area. Adam Ayotte jumped out to the early lead with a three wide battle for third and four wide mid pack. Dan Bork took over the second spot early on until Kelly Anderson blasted below him on lap two. A caution with three down saw Ayotte lead with Anderson in second. Jeff Brauer moved into third. 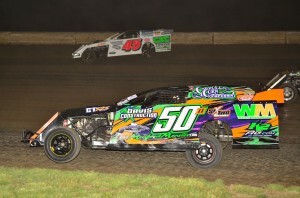 Anderson took over the lead on lap six while Brian Fetting and Ryan Siegle raced for the fifth spot. Another caution with seven complete saw Anderson leading. Ayotte sat in second with Michael Hofer and Kevin Hager side by side for the third spot. Hofer took over third on lap eight before another caution flew on lap nine. Anderson pulled away from Ayotte on the restart. Hofer sat in third with Hager and Fetting rounding out the top five. As the laps wound down Hager and Siegle raced hard for top five spots. Siegle got past Hager on lap nineteen for the fourth spot. As the checkers flew it was Anderson, Ayotte, Hofer, Siegle and Hager in the top five. 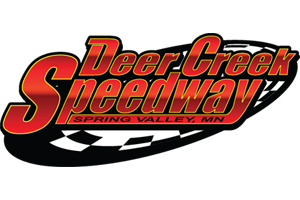 A low car count was found in the Altenburg Construction WISSOTA Late Model field tonight with many out traveling to the challenge series event. Justin Sass led out of turn two on the initial start with Mike Prochnow flying up into a three wide battle for second. Prochnow, Kelly Anderson and Roger Torgerson all made contact bringing out the yellow for a complete restart. On the restart Joe Ludemann took the lead with Neil Eckhart quickly working into second. Justin Sass came up to race with Eckhart for the second spot but was unable to make a pass for the position. Kyle Jumbeck worked his way into the top five and by lap twenty was challenging Eckhart for the second spot. As the checkers flew over the field Ludemann took home the win, Eckhart, Jumbeck, Sass and Anderson rounded out the top five. 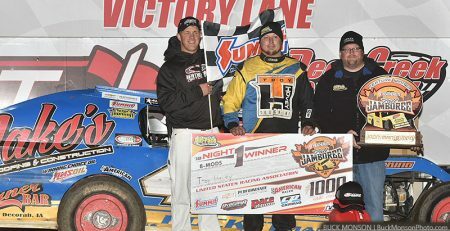 Todd Scharkey had the top side of the speedway working to his liking early on in the NAPA AutoCare USRA Modified feature event with Nate Wasmund in second and Mike Sorensen third. With two down AJ Wiste was in fourth while Bob Timm and Jay Ihrke battled for fifth. Four down saw Ihrke in fifth and starting to challenge Wiste for fourth. Scharkey built up over a full straight away lead before the caution flew on lap ten. On the restart Scharkey took off with four wide battle for sixth between Brandon Davis, Jason Cummins, Lucas Schott and Dan Bohr. 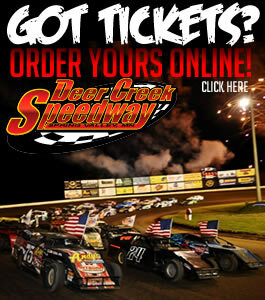 Nate Wasmund held onto the second spot as Davis worked into fifth on the bottom of the speedway on lap sixteen. Davis moved past Sorensen for fourth on lap eighteen as another caution flew. On the restart Scharkey led with Wasmund, Sorensen and Davis three wide for second. Wasmund held onto second until lap twenty one when Davis pulled alongside. ON lap twenty three Davis moved alongside of Scharkey for the lead and completed the past as the white flag flew over the field. At the finish it was Davis with the win over Scharkey, Wasmund, Cummins and Sorensen.